Trenbolone is similar to the highly popular steroid Nandrolone, in that they are both 19-nor steroids, meaning that a testosterone molecule has been altered at the 19th position to give us a new compound. Unlike Nandrolone however Trenbolone is an excellent mass and hardening drug with the majority of gains being muscle fiber, with minimal water retention (1) It has an unbelievable anabolic (muscle building) score of 500. When you compare that to Testosterone, which itself is a powerful mass builder, and has an anabolic score of 100 you can begin to fathom the muscle building potential of Trenbolone. What makes Trenbolone so anabolic? Numerous factors come into play. Trenbolone greatly increases the level of the extremely anabolic hormone IGF-1 within muscle tissue (2). And, its worth noting that not only does it increase the levels of IGF-1 in muscle over two fold, it also causes muscle satellite cells (cells that repair damaged muscle) to be more sensitive to IGF-1 and other growth factors(3). The amount of DNA per muscle cell may also be significantly increased (3). Trenbolone also has a very strong binding affinity to the androgen receptor (A.R), binding much more strongly than testosterone (4). This is important, because the stronger a steroid binds to the androgen receptor the better that steroid works at activating A.R dependent mechanisms of muscle growth. There is also strong supporting evidence that compounds which bind very tightly to the androgen receptor also aid in fat loss. Think as the receptors as locks and androgen's as different keys, with some keys (androgen's) opening (binding) the locks (receptors) much better than others. This is not to say that AR-binding is the final word on a steroids effectiveness. Anadrol doesnt have any measurable binding to the AR& and we all know how potent Anadrol is for mass-building. Trenbolone increases nitrogen retention in muscle tissue (5). This is of note because nitrogen retention is a strong indicator of how anabolic a substance is. However, it's incredible mass building effects do not end there. Trenbolone has the ability to bind with the receptors of the anti-anabolic (muscle destroying) glucocorticoid hormones (6). This may also has the effect of inhibiting the catabolic (muscle destroying) hormone cortisol (7). 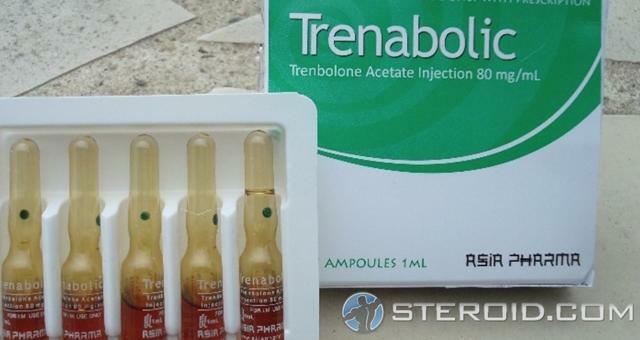 Trenbolone is also a highly androgenic hormone, when compared with Testosterone, which has an androgenic ratio of 100; Trenbolone's androgenic ratio is an astonishing 500. Highly androgenic steroids are appreciated for the effects they have on strength as well as changing the estrogen/androgen ratio, thus reducing water and under the skin. As if the report on Trenbolone was not good enough, it gets better; Trenbolone is extraordinarily good as a fat loss agent. One reason for this is its powerful effect on nutrient partitioning (9). It is a little known fact is that androgen receptors are found in fat cells as well as muscle cells(10), androgens act directly on the A.R in fat cells to affect fat burning. (11) the stronger the androgen binds to the A.R, the higher the lipolytic (fat burning) effect on adipose tissue (fat)(11). Since some steroids even increase the numbers of A.R in muscle and fat (11, 12) this fat loss effect would be amplified with the concurrent use of other compounds, such as Testosterone. Now that the properties of Trenbolone Acetate have been explained we can better understand how to use it in order to maximize its advantages. Evidence suggests that Finaplix when stacked with estrogen promotes more weight gain that Trenbolone alone(22), now Im not telling you to go pop some birth control with your Tren but the addition of aromatizing orals such as Dianabol and a long estered testosterone such as Cypionate or Enanthate would produce great gains in a bulking cycle. For a cutting cycle Finaplix is the best choice you have; Trenbolone's powerful effect on nutrient shuttling allows a user to restrict calories and remain in a state of positive nitrogen balance (remember what that means?). The cortisol reducing effect and binding to the glucocorticoid receptor will greatly reduce the catabolic effects of harsh dieting and excessive amounts of cardio and not to mention that Finaplix itself may burn fat (due to its strong AR-binding). A good choice to stack with Tren in a cutting cycle is Winstrol. Winstrol has a low binding affinity to the AR and thus will act in your body in vastly different ways than the Tren (i.e. in non-receptor mediated action). In addition, Winstrol is a DHT-based drug and Tren is a 19-nor& throw in some Testosterone (prop), and you'll have a cutting cycle which takes advantage of all 3 major families of Anabolic Steroids (Testosterone, 19-nor, and DHT), as well as vastly different AR-binding affinities and mechanisms of action. Ironically, even though Trenbolone ( Tren ) is an excellent contest prep drug, it lowers your thyroid level(23), and this raises prolactin. I recommend taking T3 (25mcgs/day) along with your Tren to avoid elevating your prolactin too high via this route. Also, this drug is a poor choice for athletes who rely on cardiovascular fitness to play a sport. Trenbolone ( Tren ), anecdotally at least, reduces many athletes ability to sustain high levels of endurance. Unfortunately, this makes Tren a poor choice for many. As of now the main source of Trenbolone is from implants for cattle being converted into an injectable or transdermal compound, from powder, and of course Underground Labs. "Home brewing" powder or cattle implants seems to be the preferred method of obtaining injectable Trenbolone Acetate, because the user would have much more control over the potency and sterility of the drug. Trenbolone is much more expensive than other anabolic steroids ranging from 15 U.S dollars per gram of powder or 150 U.S for a single 10 ml bottle. The cost of Trenbolone should not matter, it is worth every penny.